Today I modelled at Jackson’s Lane community and arts centre in Highgate, North London. The group is for older people, 55+, but most are in their 70s and 80s. Despite this sad tale, Edna expresses a lot of happiness on her smiling face and in her twinkling eyes. She has lived a lot throughout her life so far, working as a psychotherapist, travel writer and latterly a photographer. She used to climb mountains and dance a lot. Fellow artist Sheila suggests it is better not to look back because it may remind us what we have lost; better to look forward as life is always full of surprises! Sheila and Edna both clearly have some experience of life drawing, and an artistic sensibility. As I photograph their work, they ask what for, so I explain about Spirited Bodies. I mention the 73 year old woman who had had 2 hips and a knee replaced so only posed sitting down, and did not tell her judgmental family. I also recount the recent appearance of 82 year old Arleen who is a life model (who has had a mastectomy), at our Southbank event. Edna and Sheila are all ears, asking where can they find out more? When will there be an opportunity in North London? It is as if I have poured a drop of hope into their midweek afternoon. The class awaits more funding to be resurrected (today is the last session in a series) and I sincerely hope it is. I love this luxurious final pose! Some lovely drawings by a very sweet group; rarely does life modelling feel so much like it could help someone. So wonderful. 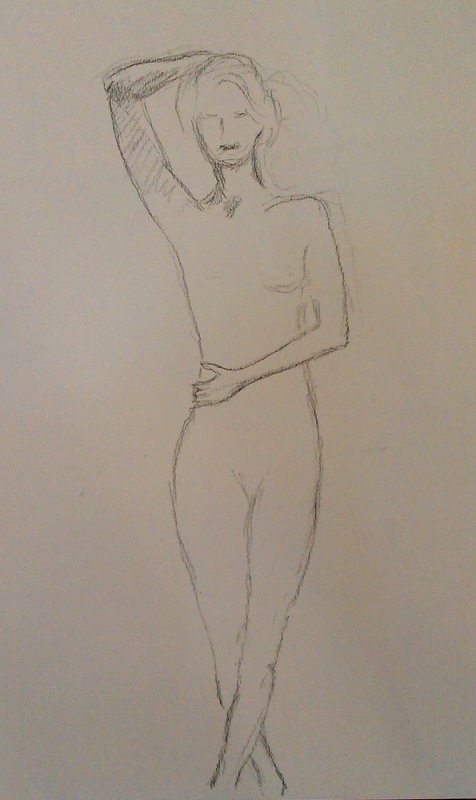 I always feel energized about my body after going to life drawing! When I am modelling I often think, ‘I must come and draw more often’ and then I don’t. Reckon as I get older I will as I’ll want to be more selective about modelling but still want to be practising, only as the artist instead. It makes sense that all involved in the process get connected to their bodies a bit more! I too enjoy posing for older artists. Whereas the young and fit take their beauty for granted, albeit often with an opinion skewed by media pressure, mature artists know the transient nature of the conventional body beautiful. They can appreciate the varying forms of wonder to be seen in the human form of any age. As an older model, I do not worry about comparisons with younger ones. I proudly offer myself as the current version of a growing organism that is different from, but not inferior to, my younger self. While the pictures produced by artists of different generations may not be obviously different, the opinions expressed in conversation are often more rounded from those with greater life experience. Oh, and you often get better tea and cakes with older groups! Thanks for your comment Rob. I am going to try and promote the idea to organisers that providing groups for the really elderly is a wonderful opportunity. 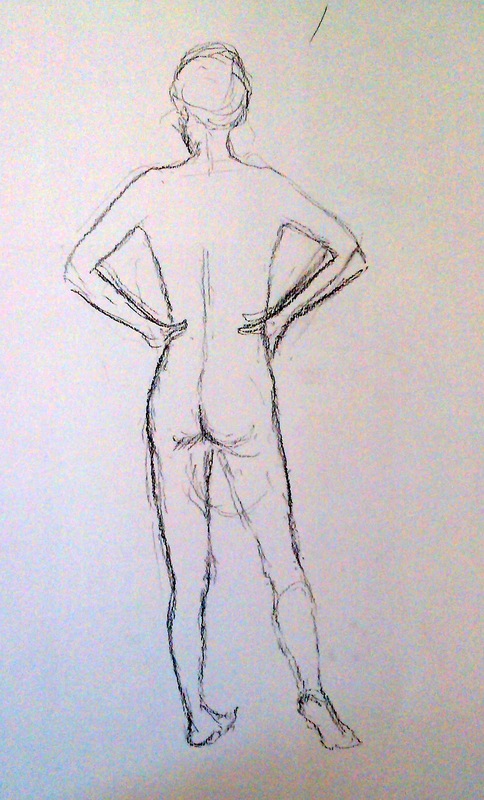 I know lots of older people already go to life drawing, but there are others who haven’t thought of it but might give it a go if it came through their local authority/housing association or the sheltered home they live in as was the case with this group. They are older and less mobile, so special transport has to be arranged, and they need to know they are going to a group which supports all their needs. I am glad I am not alone enjoying these people’s company! 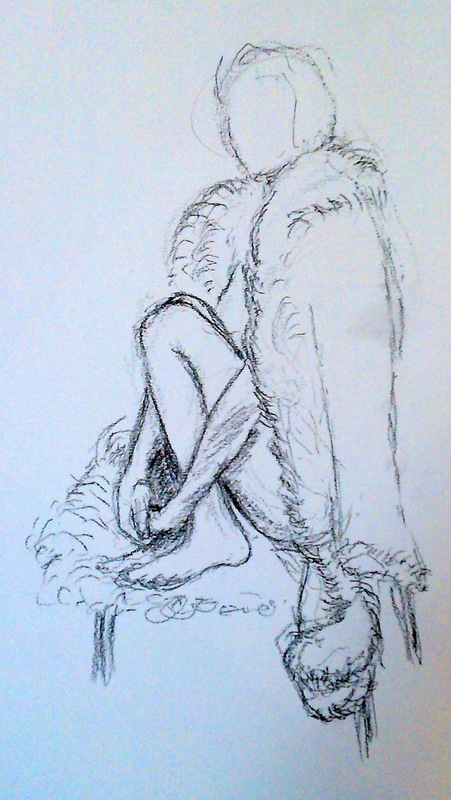 I think that life drawing is a great activity to take to sheltered housing and care homes, where they are always looking for new interesting things to do. We need only to transport the model and tutor (who could be the same person) to the venue, and to provide sketch pads and media. All such places that I have visited have a large communal room that could accommodate this activity. Perhaps we should canvass interest. yes, so rewarding, and fun! They often are less serious about their work, it’s more of a social, and maybe an unusual chance to open up, be themselves. Power to this idea!